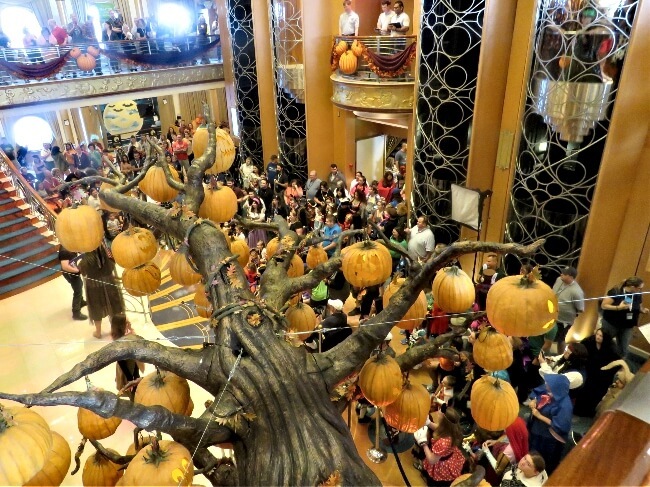 Every Autumn, Disney Cruise Line transforms its ships into floating Halloween parties. From late September through early November, passengers enjoy even more activities; on top of all the normal fare. 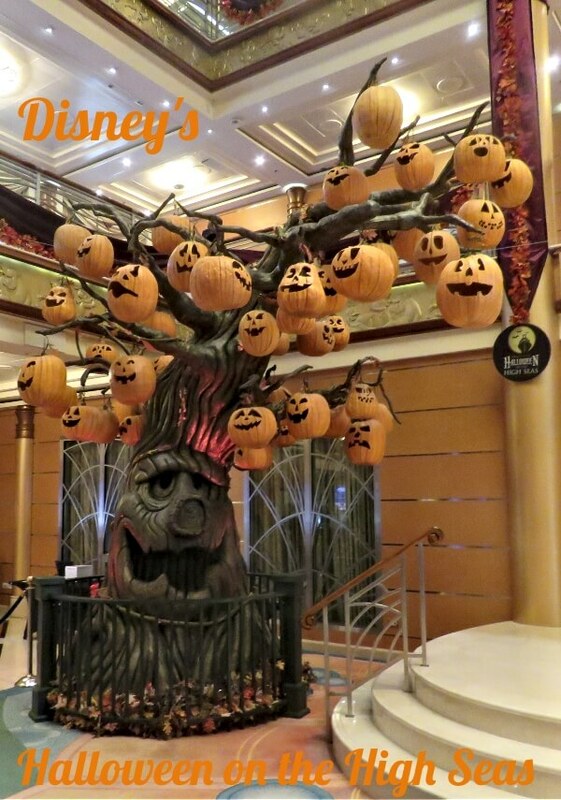 This October, we took our first Disney’s Halloween on the High Seas Cruise. My wife and son were especially excited. They enjoy Magic Kingdom’s Halloween party, Mickey’s Not So Scary Halloween Party, more than I. 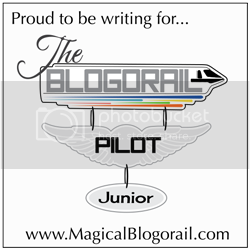 Read on to see what to expect and how we liked it. 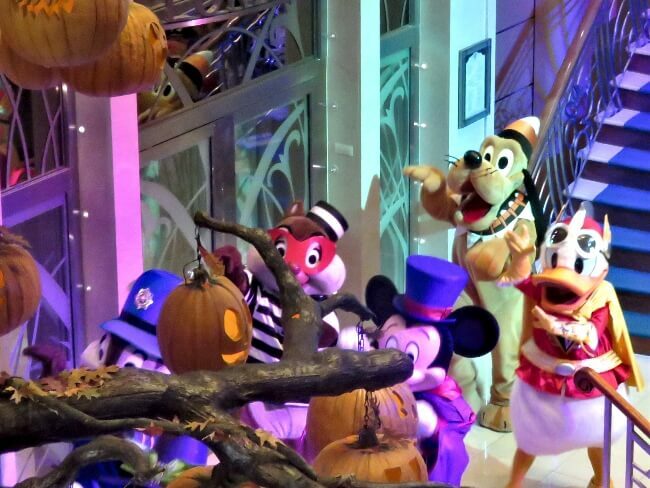 Characters in Costumes – Mickey, Minnie, Donald and other Disney characters don Halloween customs for shows and meet and greets. Jack Skellington and Sally from “A Nightmare before Christmas” also roam the corridors. Passengers and Crew in Costumes – Many adults and practically all children pack their costumes. Of coarse, there are princesses and superheroes, storm troopers and Disney characters. I also saw Napoleon Dynamite, Beetlejuice, and Clint Eastwood. 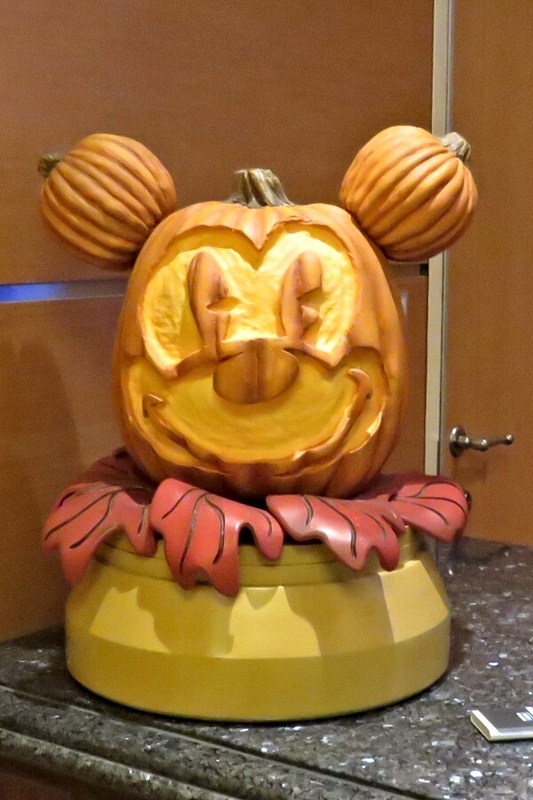 Halloween Music – For a day, the classical Disney tunes that normally fill the air are replaced with Halloween music. During Star Wars Day at Sea, we found the music to be oppressive and not fun. This was much better. Songs played included Superstition (I love Stevie Wonder), Bad Moon Rising, Monster Mash, and Thriller. Nightmare before Christmas Sing and Scream – A 4D version of the classic movie was played in the Walt Disney Theater. 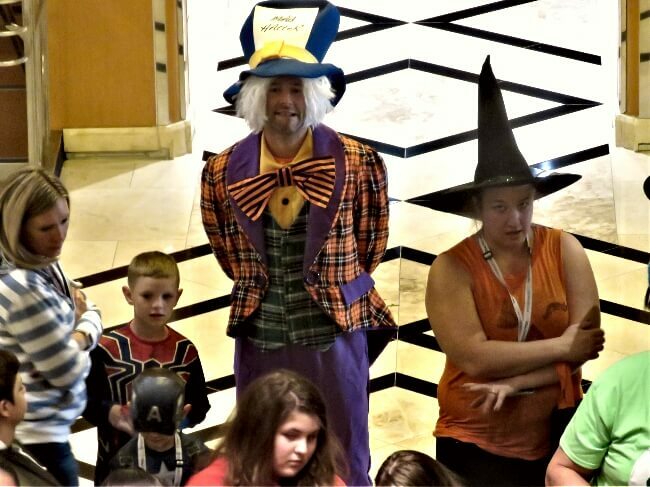 Trick or Treat – Kids trick or treated around the lobby on decks 3 and 4. Guest Services, Port Adventures, D Lounge, shops, and few other spots handed out treats. Scary Stories – Not so scary stories were told each night. Dance Party – Disney characters in their costumes lead a dance party in the lobby prior to the..
Mousecarade Party – Guests were encouraged to show up and parade in their costumes. Adults Only Costume Dance Party – Even though everyone assumes that Disney is for kid’s, adults are never left out. Fathom’s hosted a dance party and best adult costume contest. Merchandise! – It’s Disney! Did anyone not expect this. Whether you will find Disney’s Halloween on the High Seas to be too much or too little will obviously vary from from per to person. 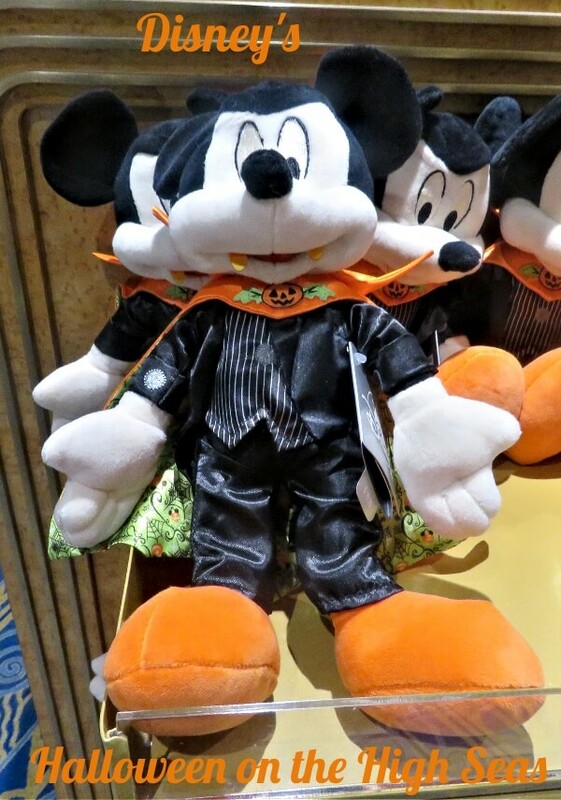 Most of the Halloween activities take place for only one day: costumes, Halloween music, trick or treat, dance parties, and Mousecarade Party. Scary stories were told nightly. 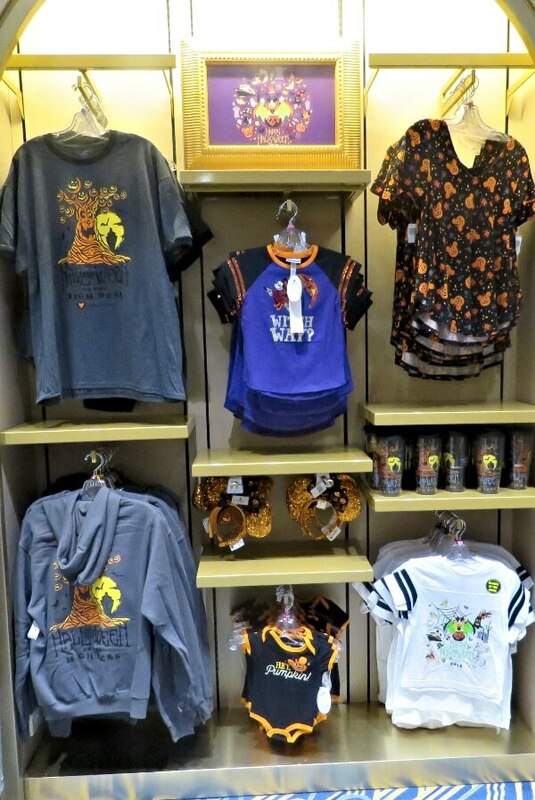 The lobby decorations and of coarse merchandise remain throughout the cruise. Very few passengers found one of six nights dedicated to Halloween to be too much. Many more were disappointed that there was not more. 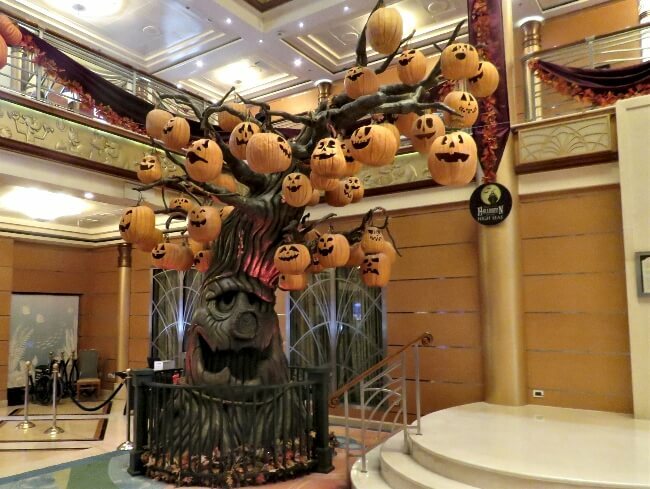 While on a 3 day cruise, passengers dress up twice, Trick or Treat night and Pirate Night. That would be much more intensive. On Star Wars Day at Sea cruises, Star Wars movies play all day in the Buena Vista Theater. We expected similar during Halloween on the High Seas; at least Frankenweenie and Hocus Pocus. Surprisingly, they only played Nightmare before Christmas. Teen – Our teen son loves Halloween and is a big movie buff. He dressed as Clint Eastwood’s spaghetti western character Blondie. He enjoyed the activities and decorations, but was quite disappointed that they were so limited. More Halloween movies like Frankenweenie and Hocus Pocus would have improved his opinion. Mom, Halloween fan – It was okay. It didn’t really add or detract from the overall cruise experience. She wishes that there were more decorations, like happy pumpkins and lights, throughout the ship. 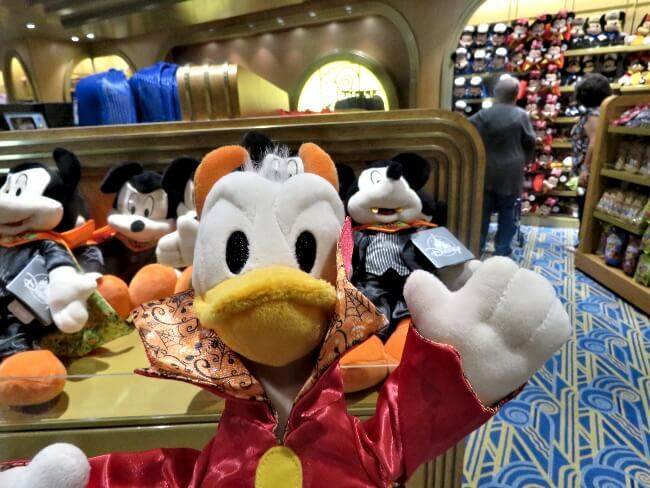 Dad, ambivalent – Like mom, I felt that it didn’t change the overall Disney Cruise experience. Except, I will never regain the 90 minutes wasted watching Nightmare before Christmas. It is a Disney Cruise. Whether or not you like Halloween, you will enjoy it. 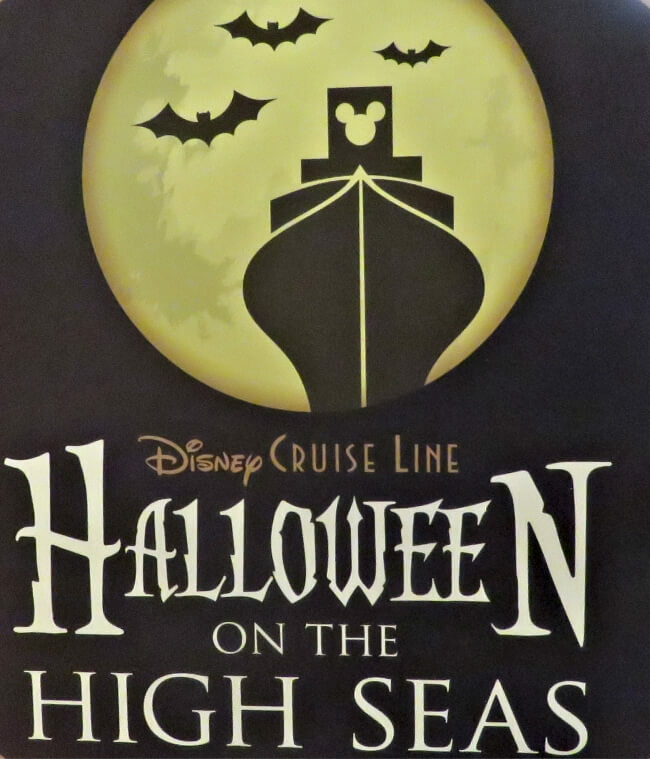 If you love Halloween, Disney’s Halloween on the High Sea will likely add to your experience. For all others, it really should not decrease your fun. There is so much more to do. 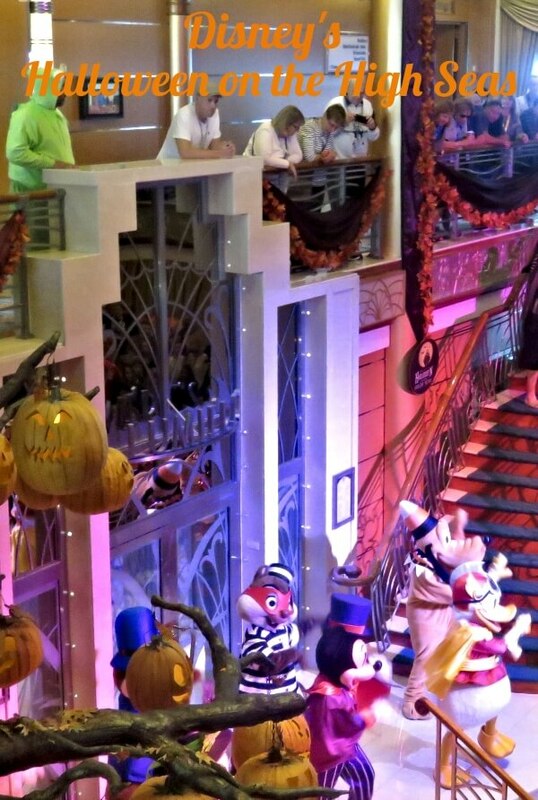 For most of us, Disney’s Halloween on the High Seas should have little to no impact on when you take a Disney cruise.